September 9, 2015: At breakfast in the basement of the hotel, we met two women from Montana who had walked all the way from Rabanal the day before, a distance that Greg and I had done in 2013. We compared notes and bid them farewell as we went back to the room and readied for the long journey to Villafranca. Wandering back through the Old City to Plaza Encina, we found the Camino down Calle Randero and were soon across the Iron Bridge. 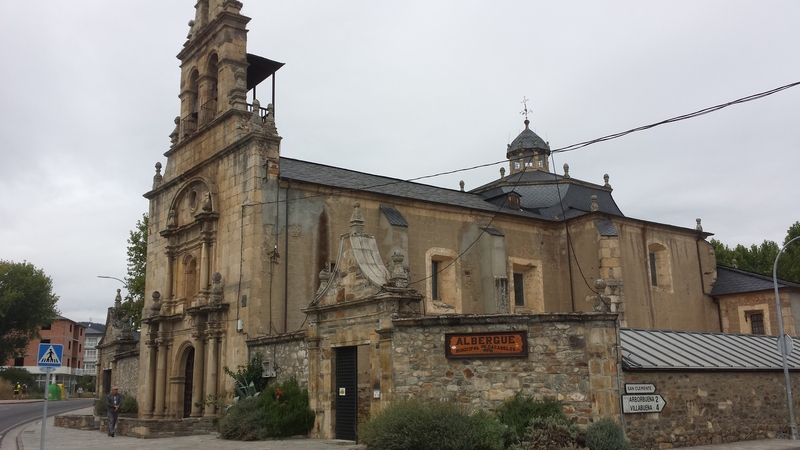 We opted to take the alternative route through Parque de la Concordia along the Rio Sil and followed that until we were up out of the city and nearly into Compostilla. 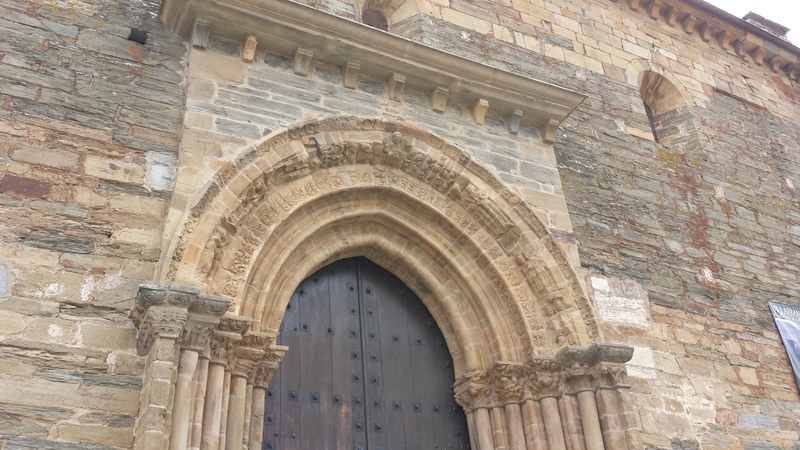 Walking through the grounds of the Iglesia Santa Maria, we were soon out to the suburbs of Compostilla. Here we stopped at a bar for cafe con leche and to use the restrooms. Then it was just a short jaunt to Fuente Nuevas. As we wound our way through the long village, we could consistently smell the distinct aroma of marijuana. We couldn’t tell if it was coming from the houses or if someone was smoking weed as they were walking along. Mystery never solved. 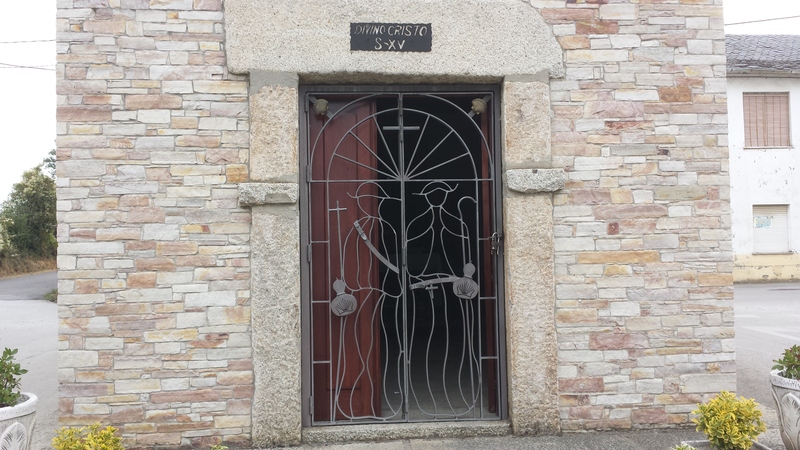 At the back end of a small chapel, we were both caught by some exquisite iron work on a door. All during this early part of the day, the sky was quite threatening and we were certain a storm was imminent. Only a few sprinkles to this point, however. About 2.5 km later we were entering the town of Camponaraya. At the outskirts we saw a local citizen roasting peppers on a grill outside a run-down shack. Near the center of town, we sat to rest at a small park. A local woman came up to us and wished us Buen Camino and asked us something in Spanish that we couldn’t understand. A fellow prilgrim seated nearby told us that the woman was indicating that inside an adjacent church we could get our credencials stamped. We told the woman we now understood, and she seemed quite happy about it. Sure enough, after we got up to leave, we saw the woman set up at the top of the steps leading to the church at a table. We gave a donation, signed the guestbook, and received the sello from the woman. The fellow pilgrim that helped us understand had just stopped there before us, and I noticed that she and a companion were from Italy. As is so often the case, we kept seeing them throughout the remainder of the day. Before leaving the central part of the town, we stopped at another bar and got a Coke Zero for Heather and coffee for me. Feeling refreshed, we proceeded to the end of town and crossed through the roundabout and past a bodega onto a trail that led up out of town and across the busy A-6. Almost immediately we were once again out into the countryside that was thick with vineyards and found ourselves in the midst of grape harvesting. It was at this point that the rain decided to come down in a big way, and we had to poncho up for the first time on our trip. 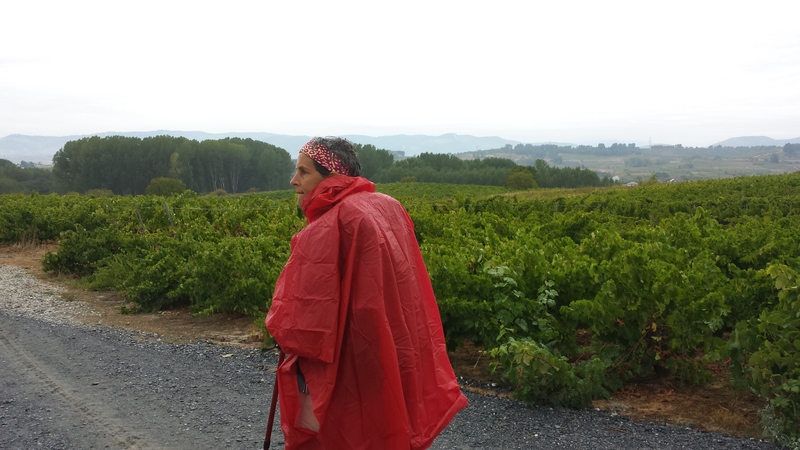 As we moved down through the vineyards and into a stand of eucalyptus trees, the rain let up a little and Heather removed her poncho. I kept mine on because I knew it was just a matter of time before I would need to use it again. Five km later we were entering Cacabelos. We kept moving, enjoying a brief respite from the rain. 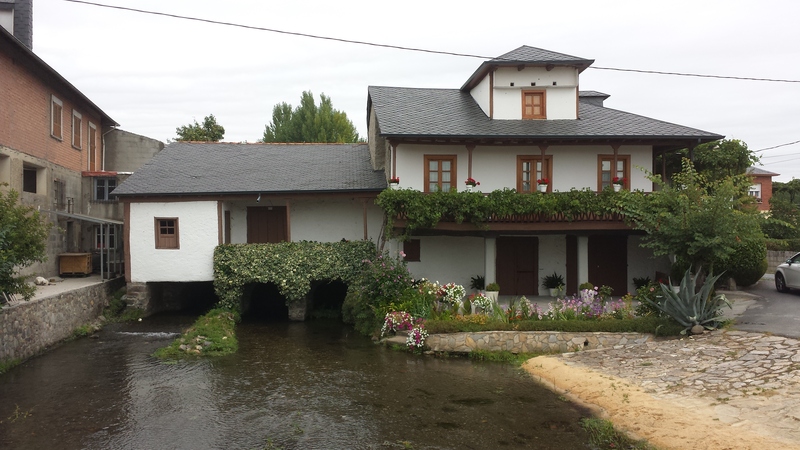 At the far end of town we encountered a house that had a river running through it. Here was also located the old municipal alberque. Heather was now showing signs of the right thigh strain and needed to rest often. We took every opportunity to find a comfortable sitting place where she could stretch and re-gain some strength. One of these resting spots was directly across from an interesting bar on the other side of the road. By now the sun had come out, but Heather’s pain had grown worse. At one point she stopped midway up a hill and said she couldn’t go on. It was at this point that I took her back pack and told her to hold her trekking poles out in front of her. With both packs on me, I grabbed her poles and pulled her up the hill, much like a horse would, I suppose. At the top of the long hill, we rested for awhile, and she seemed to regain her energy. 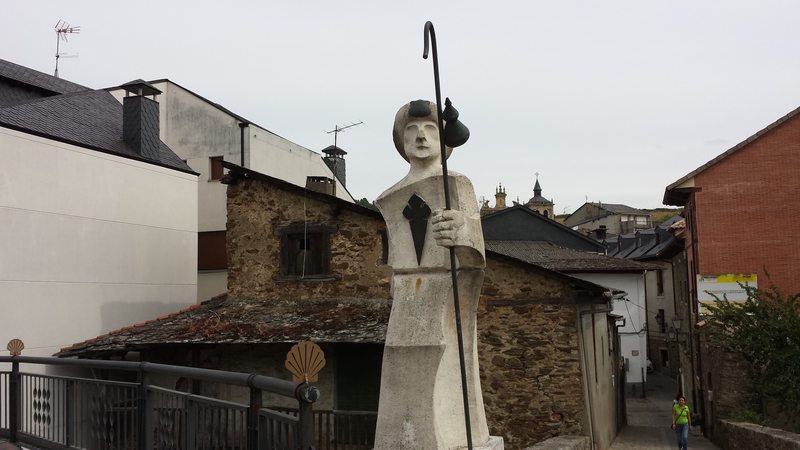 By now, the uphill climbing was over and we soon joined the other camino trail. I knew it was not long to Villafranca from here and encouraged Heather to stay with it. She gritted her teeth and kept on moving. What great courage, to walk through pain such as this. 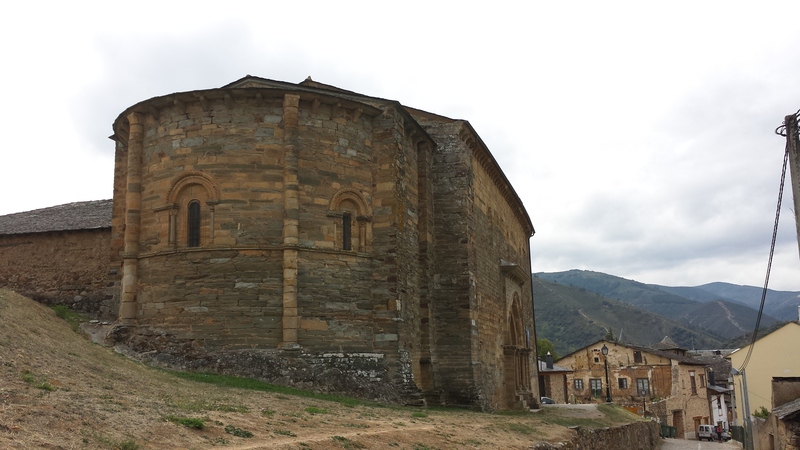 Within minutes we were coming into Villafranco and on our left was the beautiful Romanesque Church of Santiago, built in the 12th century with its Puerta del Perdon (Door of Forgiveness). The challenge we now faced was traversing the steep hill down into the town center. I took what I thought was a shortcut to lead us through town to our hotel, but found that we and routed ourselves to the Plaza Mayor. While there, I decided to stop at an ATM and get some cash. I tried three different banks, and my debit card would not work at any of them. This caused great concern for me, because I knew I would need the cash going into the mountains. I decided that I would call the bank when it opened in California after I got settled into the hotel. After a few moments, we corrected our path and found the little bridge that led over the rio Burba and located the hotel, Casa Mendez. At the main desk was a familiar face that I recognized from two years ago. After we checked in, we got a drink and sat outside on comfortable sofas with a small plate of potato chips. I looked at my Fitbit tracker and it indicated that we had walked 17.9 miles that day and over 40,000 steps. A new record! The WiFi was not working well and we had difficulty staying connected. Later, in the room, I called my bank in California and got through to Customer Service. After checking the records, they indicated that the ATM was trying to draw the funds out of my savings account, which I had drained out and put into my checking account. They switched back $500 into the savings account in case that happened again. I thought I would go back to Plaza Mayor and try again, but it was a 40-minute round trip walk to get there, and I was just too tired to do it. Fortunately I had some remaining Euros to pay for the hotel and dinner that evening, but I really needed to get some cash from that point on. I was confident that there would be some ATMs in some of the towns the following day. We took a brief nap after showers and went down to the dining room at 7:30. No one had told us that we needed to make a reservation, and the waitress seemed a little flustered that we just showed up. They did make room for us, however and we ordered our meal. Heather ordered trout (Trucha) for her Segundo and received a plate with two small trout with the heads and tails still attached. She was horrified and did the best she could to eat it, but was a challenge. I had a delicious pork dish with the omnipresent potatoes of course. Our dessert was a great ice cream cake that almost wiped away the memory of the trout staring up at Heather. At the dinner table, we got a good connection through Heather’s phone and she posted some pics to Facebook. Tomorrow, we will start heading up the mountain towards O’Cebreiro.